How you update your CDT 1.x project to the current CDT project format depends upon whether the project is a Standard Make project or a Managed Make project. For a Standard Make project, see Convert to C/C++ Project Wizard below. 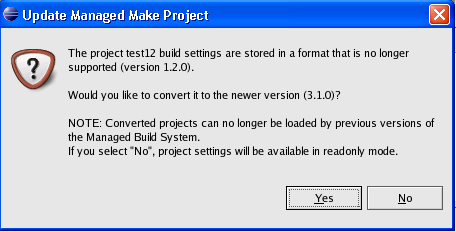 For a Managed Make project, the Managed Build system will prompt you to convert your project when it attempts to read the Managed Build project information and discovers that the project needs to be updated. You will be prompted to update the project. Click Yes and the project will be updated. The updated Managed Build information can no longer be loaded by CDT 1.x or CDT 2.x. Select No and the project will not be updated. You will be able to view the Managed Build settings, but no changes will be saved when you close the project or exit Eclipse. Select File > New > Convert to a C/C++ Project. If that selection is not available, you can find the instructions for adding it here. 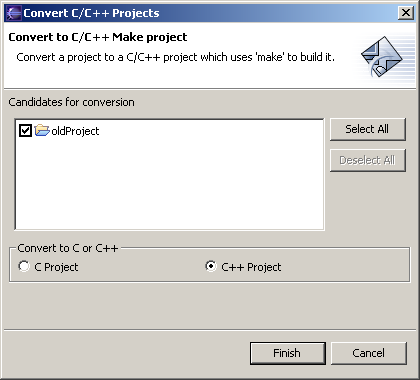 From the Convert to C/C++ Make Project Wizard select the project you want to convert and click Finish. Note: You may need to manually enable Path Discovery for CDT 1.x Standard Make projects, depending on how your CDT project was configured. See Set Discovery Options for details.